The Mount Athon is a mountain and a peninsula on the North of Eastern Greece, it’s the largest center of Orthodox monasticism in the world, autonomic community of 20 Eastern Orthodox monasteries in direct spiritual jurisdiction of the Patriarch of Constantinople (since 1312). For many centuries, the Mount Athon played a very important role in the development of spiritual and cultural life of Russia. The first known written mention of Russian monasticism on The Mount Athon refers to 1016, when it was built the monastery of Ksilurgu with a Church dedicated to the Dormition of the mother of God. In the XII century a new monastery of the St Panteleimon (now — Old or mountain Rusik) was available to Russians. The monastery was build on the shores of a small Bay on the South-West Peninsula. The monastery treasures are unique, there are the library containing over 20,000 ancient books and manuscripts, and a few precious relics, among them the relics of St. Panteleimon and the miraculous icon of the Mother of God, which was called Jerusalem. 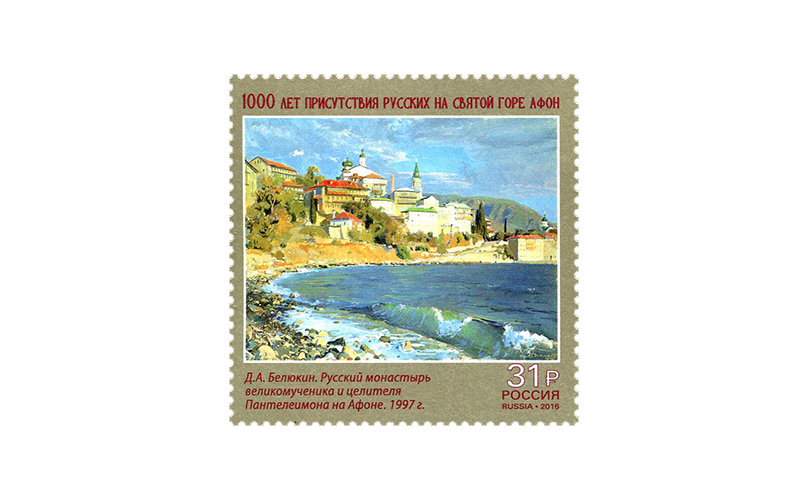 In 2016 celebrated a significant event dedicated to the 1,000th anniversary of the Russian attendance on the Mount Athon. The postage stamp features the picture of D.A. Belyukin "The Russian monastery of the St Panteleimon on the Mount Athon" (1997).